and should contact us today for details! The Cookie Jar is coated on the inside with plastic. This allows it to be washed with a wet cloth. The outside is coated with polyurethane. It stands approximately 8" x 10". 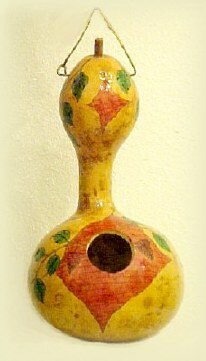 Available design patterns include: Sunflower (pictured), Grapes (pictured), Fruit, Peppers and Leaves. 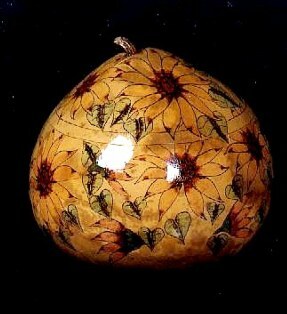 The designs are wood-burned and then stained. 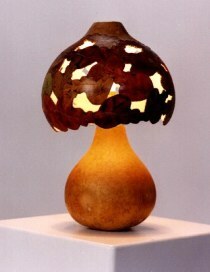 The color will not peel off or fade (unless placed in direct sunlight). The Chip & Dip Set is a party must! The dip bowl is sealed with plastic for easy clean up. After using warm soapy water, the protective coating may appear to be cloudy, but will resume to its natural beauty when dry. 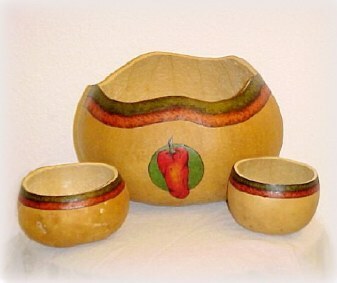 Available design patterns include: Peppers (pictured), Sunflowers and Mixed Fruit. These special Bread Warmers come with a warmer brick and instructions on how to use the brick and gourd together - GREAT GIFT IDEA. 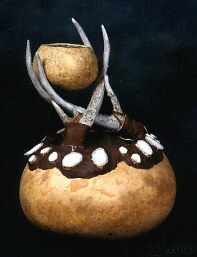 The inside of the gourd is sanded smooth and carefully cleaned to be food safe. 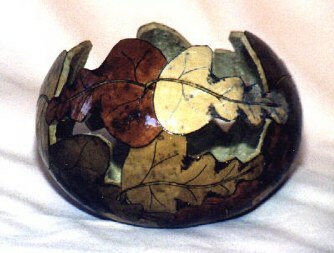 Available design patterns include: Leaves (pictured), Sunflowers (pictured), Roses, Grapes and Fruit. Gourd Baskets are a great natural way to display arrangements, use as a candy dish or to give as gifts filled with goodies. 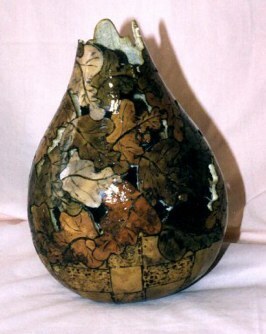 Available design patterns include: Oak Leaves (pictured), Roses (pictured), Sunflowers and Elm Leaves. These Carved Vases are beautiful free-standing pieces of art, but also act wonderfully as vases for dried or silk flower arrangement. 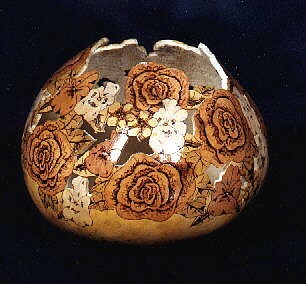 Available design patterns include: Mixed Flowers, Leaves, (pictured), Sunflowers and grapes. 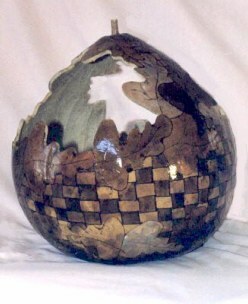 Vase sizes include: small, medium and large. 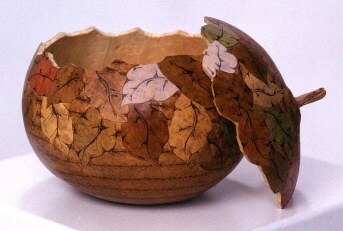 Potpourri Bowls can be used to display or hide your favorite items - potpourri, candy, jewelry, 'whatevers'. The perfect-fit lid allows you to keep your treasures 'hidden' in plain sight! 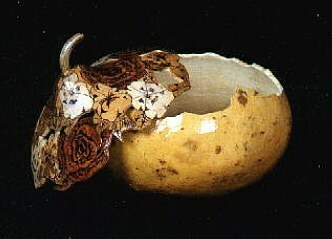 Available design patterns include: Mixed Flowers, Fruit, Roses, Sunflowers, Grapes, Chilies, Oak Leaves and Elm Leaves. 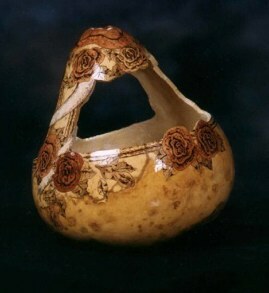 Our Carved Bowls are perfect for dried flower arrangements - or candy dishes - or potpourri holders - or ANYTHING holders! Available design patterns include: Mixed Flowers (pictured), Roses, Oak Leaves (pictured), Elm Leaves, Grapes and Sunflowers. Medium and large sizes. 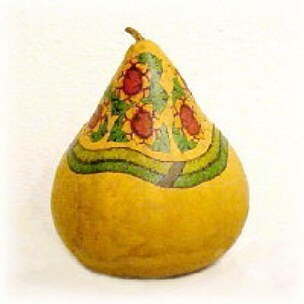 These unique gourds are a must for the kitchen acting as fresh Garlic and Onion Keepers. The cut-out openings allow the garlic and onions to breath for ideal storage. Available design patterns include: Peppers, Grapes, Southwest (pictured) and Sunflowers. 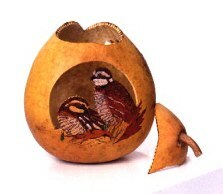 These decorative Birdhouses are also available without art work presentation for a natural effect. The feeder comes with a perch on each side and drainage holes. Available colors include: Blue Jean, Turquoise, Red and Russet. (Birdfeeders, not pictured, are also available for $15.00). 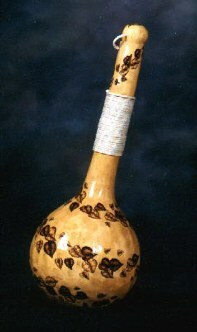 Specialty Gourds can be designed and created to meet buyer's request. For instance, you can choose your favorite color of beads for the Southwest-themed gourds, or select the appropriate animal for your demographic location (deer, quail, roadrunner, etc.) These actual working lamps can be designed to meet your specs, or a special shade can be made to fit a base you supply.